Quality reflective tape made by 3M. 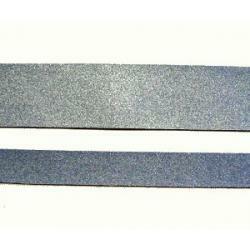 Add this thin tape to any project to increase the safety of your outdoor clothing or gear. Attach with glue surface on the tape. Silver color, non-stretch. 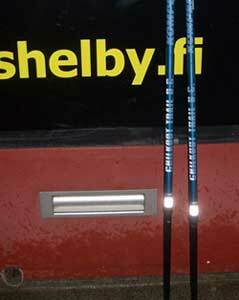 You can add this reflective tape to skis, poles, expedition pulks, bicycles etc. Fulfills the requirements of the EN471 standard. Work on flatsurface where uniform pressure can be applied. Avoid applying film over seams and stitches. 1. Remove plastic liner, exposing pressure-sensitive adhesive. Do not remove paper carrier. 2. With adhesive side down, press firmly onto substrate by starting on one end and gradually working to the other end. This will prevent air bubbles. Do not let adhesive touch the substrate until just before pressure is applied. 3. Additional adhesion may be gained by evenly pressing for 5 seconds with an iron set at "synthetic". 4. Remove the white paper liner by lifting one corner and pulling back over itself in a continuous, smooth manner. The Cleaning Towel is an Easy solution for cleaning the surface for attaching. Available affordably in small and bigger batches.